If you saw my low carb cauliflower grits breakfast bowls, you know that I’m a savory breakfast person. That’s probably why this is my first baked oatmeal cups recipe on the blog. But like Joe Dirt said, it’s not what you like, it’s the consumer. I’ll admit, I now understand the love for baked oatmeal of all varieties. 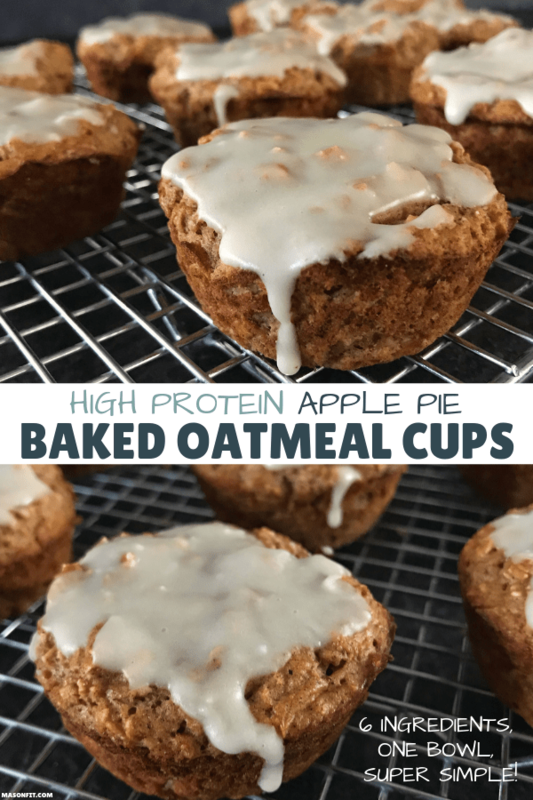 These high protein apple pie oatmeal cups are perfect for a quick breakfast, snack, or sweet night cap. Since they’re not overly sweet on their own, you can flex one to fit any time of day. And with only six ingredients and one bowl required, they’d be perfect for a lazy weekend meal prep. First on the list of ingredients is obviously oatmeal. I used quick oats, but you could use any type of oat you’d like. Whole oats may take a bit longer to cook, however. For the protein powder, I used Dymatize 100% Whey. I’m not affiliated with Dymatize, but I should be as much as I use their protein. It’s great tasting and bakes really well. That said, you can use any protein powder for these baked oatmeal cups since it’s a relatively small dose. 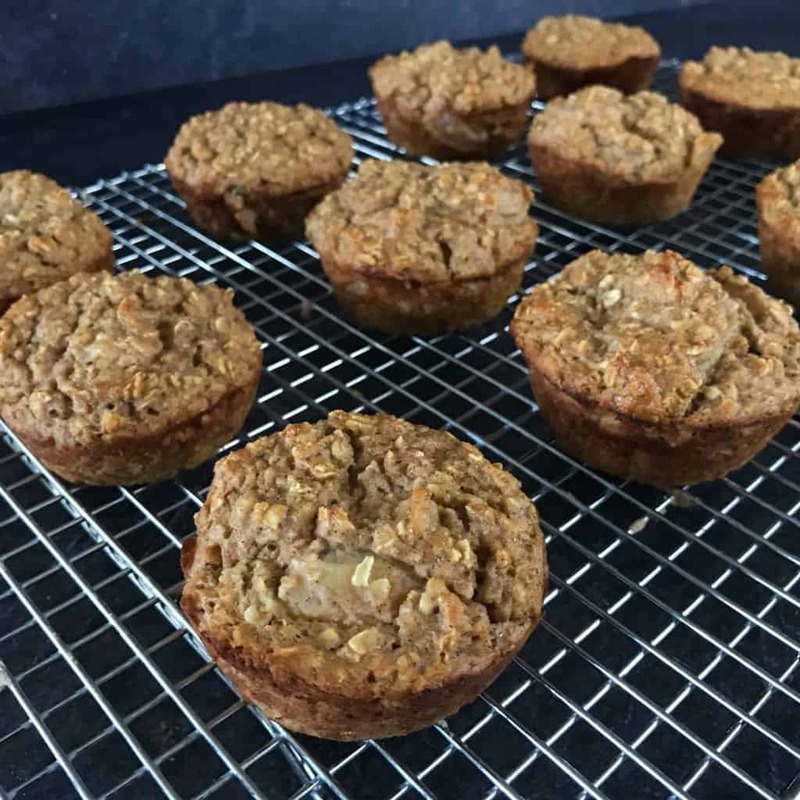 The apple pie component of these baked oatmeal cups comes from the same source as my apple pie protein donuts, sugar free apple pie filling. I buy mine at Walmart or Kroger in the baking aisle or around the canned pumpkin. 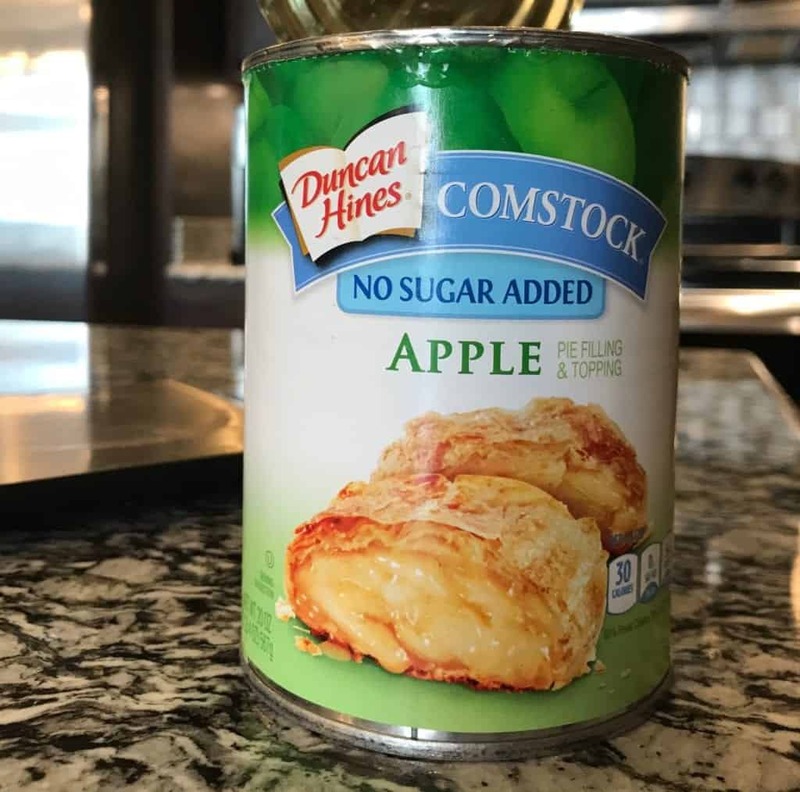 If you’re wondering about the nutritional difference between the sugar free and regular pie filling, there are 245 calories in the entire can of sugar free apple pie filling. Compare that to 630 calories per can of the regular apple pie filling. So, I’d urge you to go with the sugar free version in this recipe if calories are a concern. 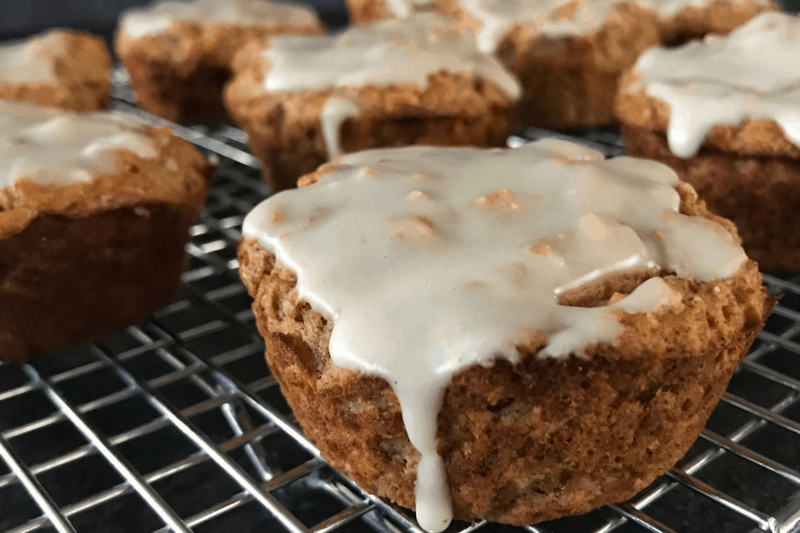 In the recipe, I mentioned these are perfect with fat free whipped cream, peanut butter, or a sugar free glaze. The glaze you see in the photos is similar to the apple pie glaze from the protein donuts I mentioned above. It’s simply unsweetened almond milk and a bit of Swerve Confectioners, a powdered sugar substitute. Swerve is the bee’s knees and if you’ve never tried it, I’d encourage you to pick some up ASAP. 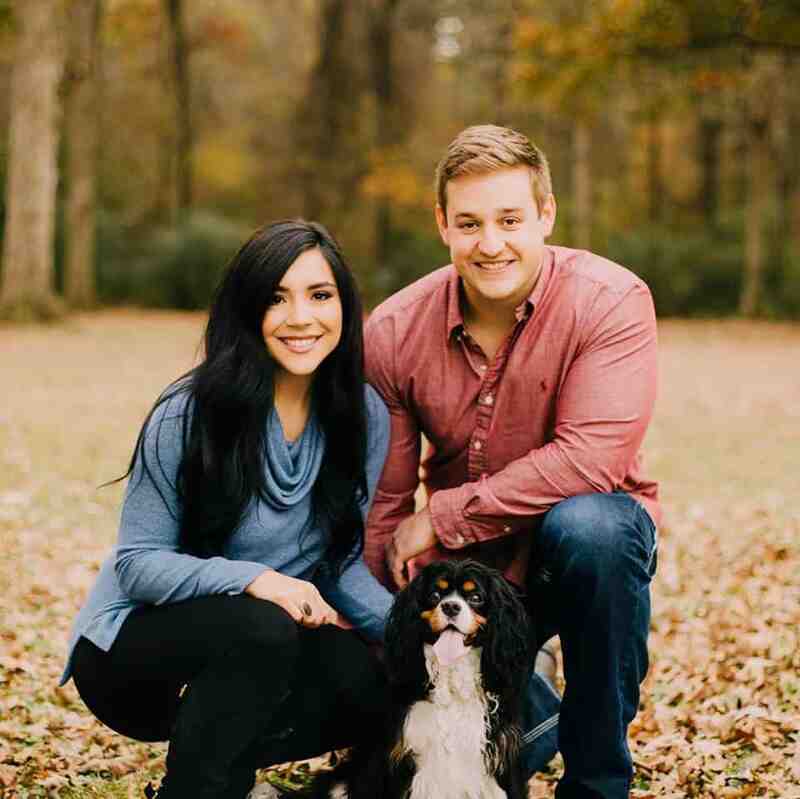 Check out all the recipes on my blog that use Swerve. One last tip for your high protein baked oatmeal cups: reheat the leftover cups before eating. These things are so good reheated, especially if you’re topping them with something. And this is coming from the guy that never likes to reheat leftovers. All righty, that’s all ya need to know. 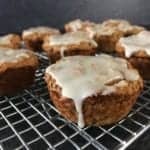 If you make these baked oatmeal cups or put your own spin on the recipe, I wanna see it. Snap a pic and tag me on Instagram. I’ll be sure to share it with the world. Baked oatmeal cups stuffed with apple pie filling and protein. Preheat oven to 350F and spray a 12-muffin tin with nonstick cooking spray or prepare silicone muffin molds. Mix the dry ingredients in a large bowl before mixing in the eggs and apple pie filling. Stir well. Transfer the mixture to the muffin tin. Every slot should be nearly full. Bake for 30-35 minutes or until the bottoms are fully cooked. 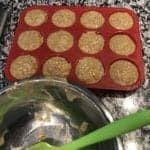 Transfer the baked oatmeal cups to a cooling rack. 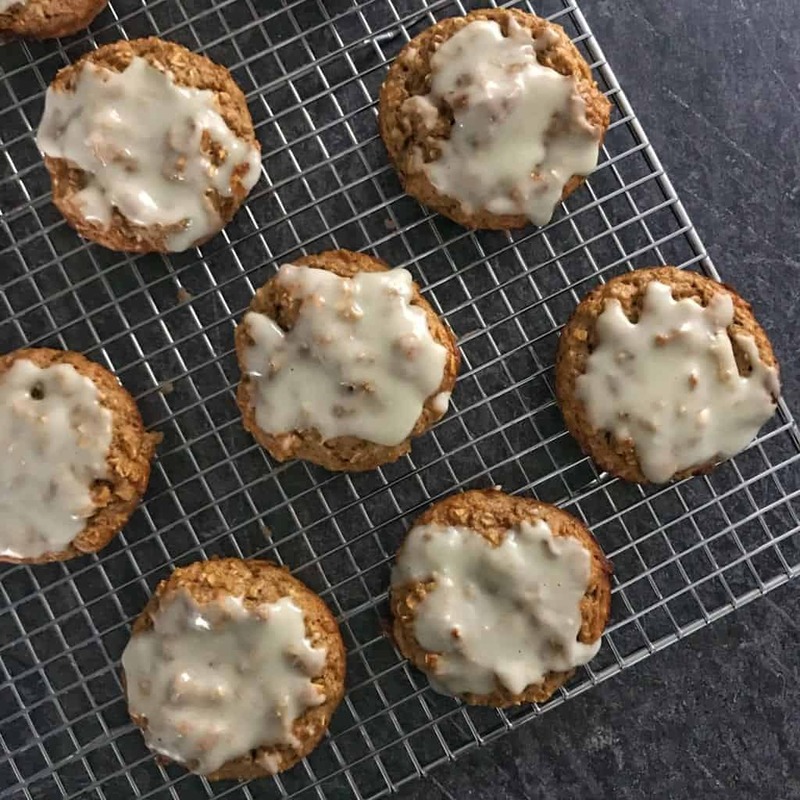 These are best served warm with fat free whipped cream, a sugar free glaze (in the recipe notes), or if you have the fat available, peanut butter. Before you go, I have a free cookbook with 15 of my most popular pizza recipes. Enter your info in the form below to get a copy straight in your inbox. Muffins are so essential in the fall/winter time. Having a healthy recipe with extra protein hits the spot! Got rave reviews on this from a few people that tried them. SUPER easy to make. I use vegan protein and it turned out just fine. I also didn’t have ‘apple pie spice’ so just used All Spice (Canada). Swerve is the icing on top of this delicious oatmeal cup, literally… Also recommend heating up a little before eating. Life Changing! I love all of your snacks especially this one! I am a University student so it’s really easy to get off track but making and prepping these recipes make it so much easier. I also find it hard to get my protein in, so these recipes are amazing for that! Thank you for everything, these are my go to breakfast. How would you store these if you were making for the week? Refrigerate without any type of glaze and avoid stacking them if possible. You could probably get away with freezing them and thawing overnight as well. I wouldn’t go too far beyond 3-4 days. You could freeze and thaw if you’re going through them slowly.